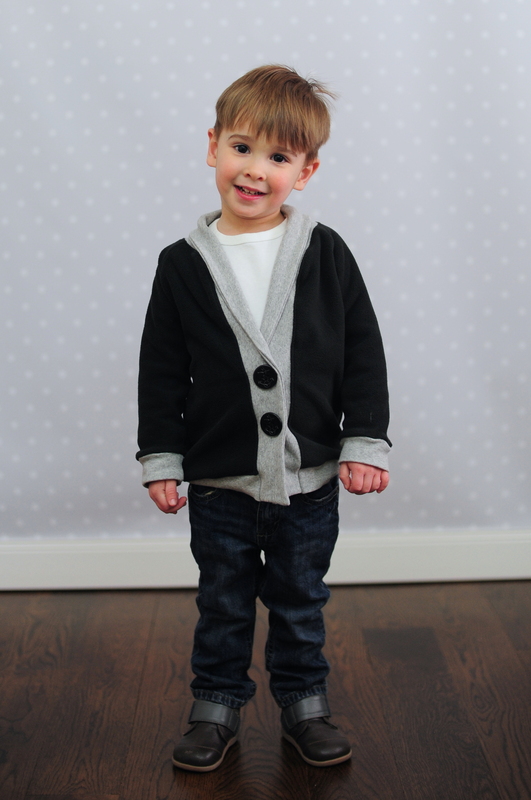 Raglan Sew-Off: It's Cardigan Time! - Peek-a-Boo Pages - Patterns, Fabric & More! 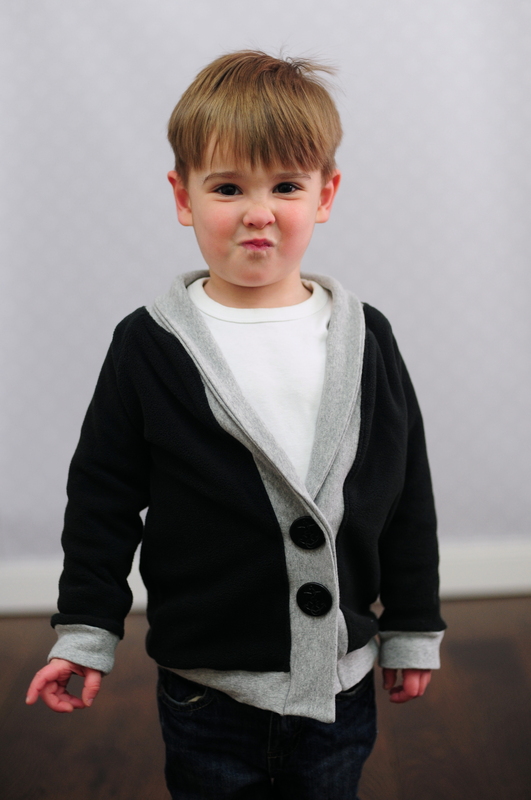 Raglan Sew-Off: It’s Cardigan Time! I’m so excited to share my Grand Slam hack with you today! 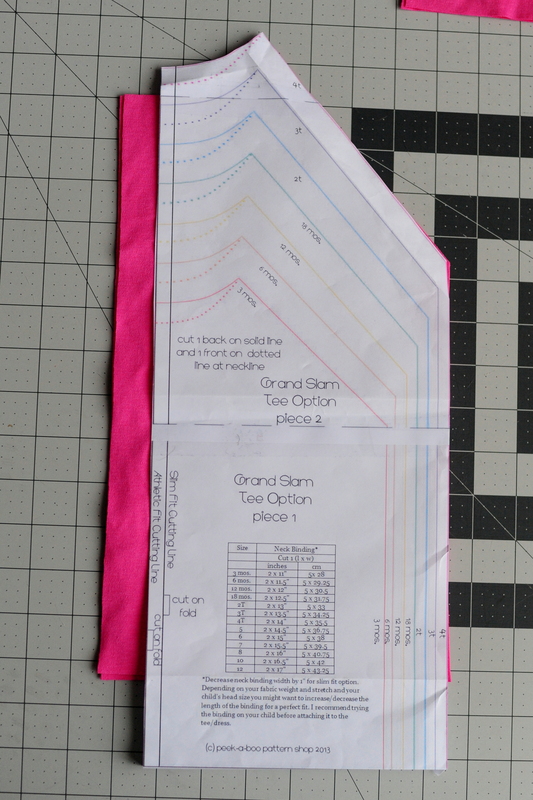 The Grand Slam was one of the first patterns I tested for Amy, and is for sure one of my most-used patterns too. I’ve shared a few twists before, like how to add a hood in this tutorial – but for this one, I really wanted to mix it up a bit more. As spring (finally!) 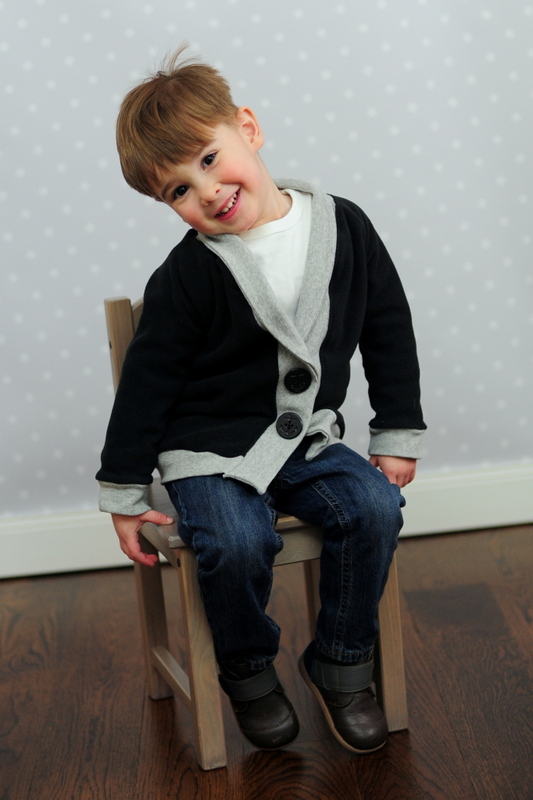 approaches here in the Northeastern US, I thought a few cardigans would be a nice addition to the kiddos’ wardrobes. Raglan style sleeves are often really conducive to jacket/cardigan patterns as they typically have a slightly lower armscye (armhole/opening) and/or a roomier shoulder than set-in sleeves. This makes them great for layering! 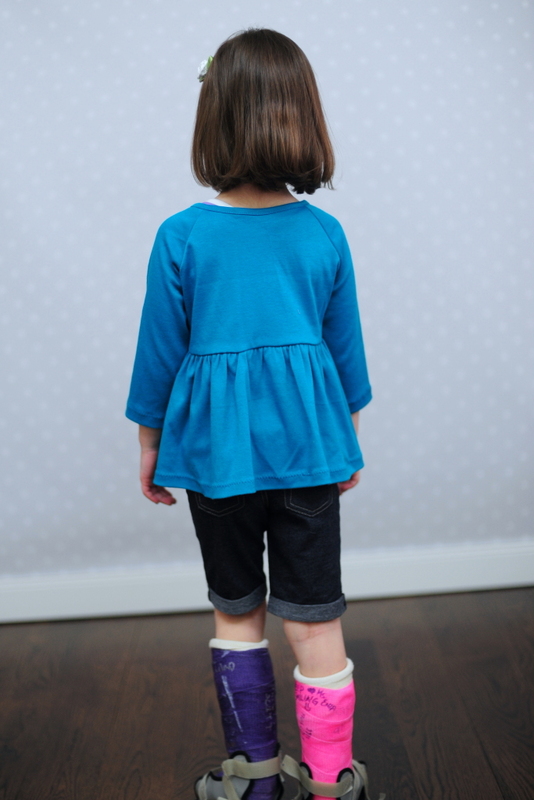 Whether or not to size up here is up to you, and will depend in part on how roomy the fit of the pattern is on your child as a shirt, and also what fabric you’re using. 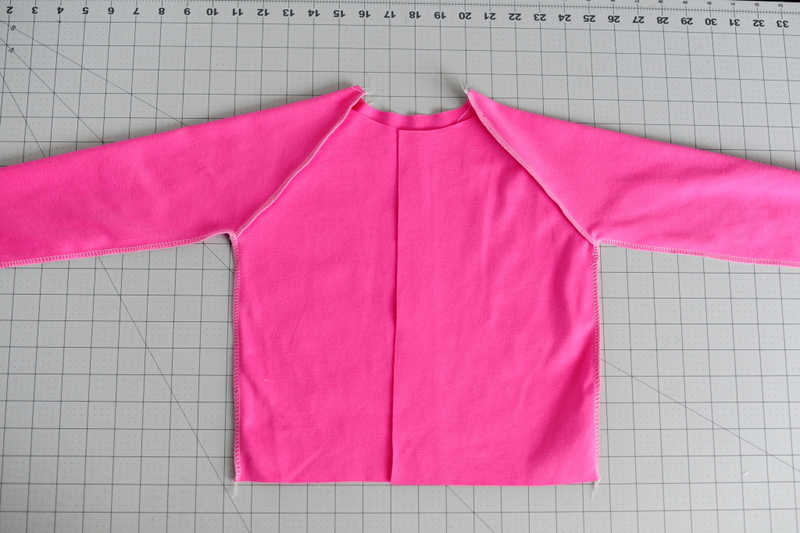 For Miss P’s cardigans, I used interlock so I kept her typical size but used the athletic fit rather than the slim fit, and took a slightly smaller seam allowance to give her a little more breathing room. (Since the SA for this pattern is 1/2″, I used between a 1/4″ and 3/8″ SA depending on how much extra room I wanted.) For A’s shawl collar cardigan, I sized up one size. As you can see in the pics, it’s quite roomy for him. I’d make some alterations next time, but I was afraid the fleece would be too snug if I didn’t size up. Oops. 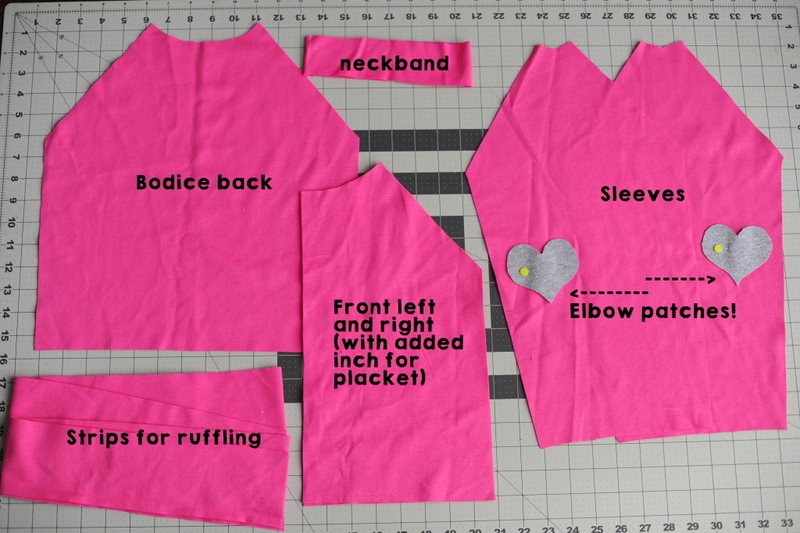 To make a cardigan, the main alteration you’ll need to make is to cut the front bodice piece right down the center. (Unless you want an asymmetrical cardi, which would be cool too. 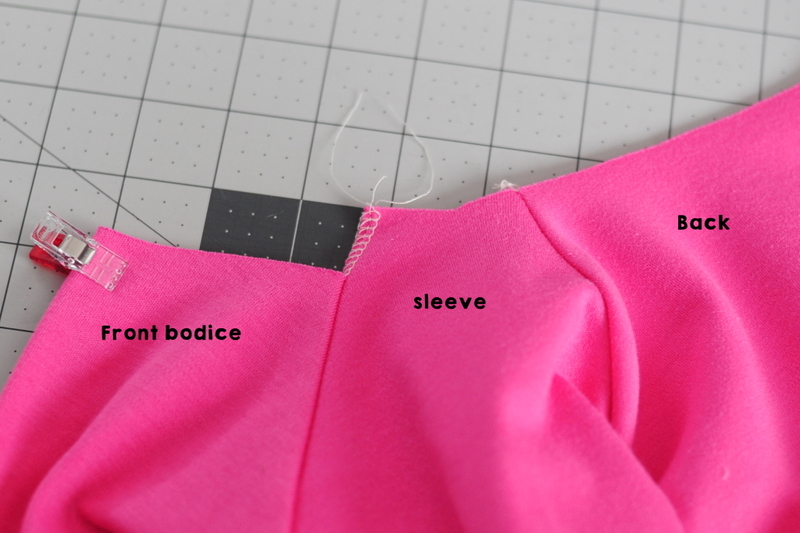 😉 ) Instead of cutting your pattern piece on the fold, you’ll cut down that fold line to give yourself one left bodice and one right bodice. Make sure to cut them mirror image so you have one of each. 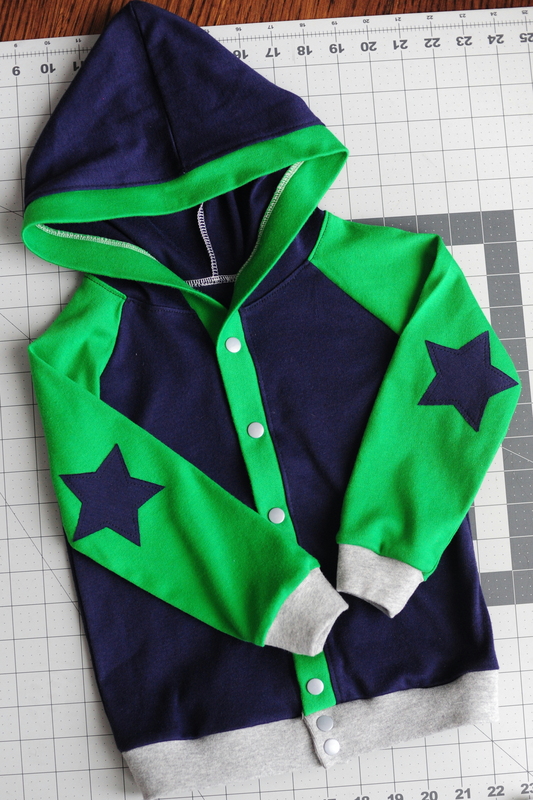 I also made a version for my little guy that used the Boardwalk hood – I extended the binding around the hood all the way down to the waistband there, too, and that made a perfect placket for the hoodie. You’ll notice in the picture above with the pattern piece that I shortened the bodice here – that was to account for the ruffle, which was cut to 3″ long for this cardigan. I wasn’t quite sure how long I wanted to make my ruffles, so I tried a few variations. The ivory cardigan below had a short ruffle that was approximately 1.5″, and the teal was cut to 9″. For all three of these cardigans I cut between 1-2 widths of fabric, ruffled them (I used my serger, but you can use your preferred method), and then just cut off the excess. 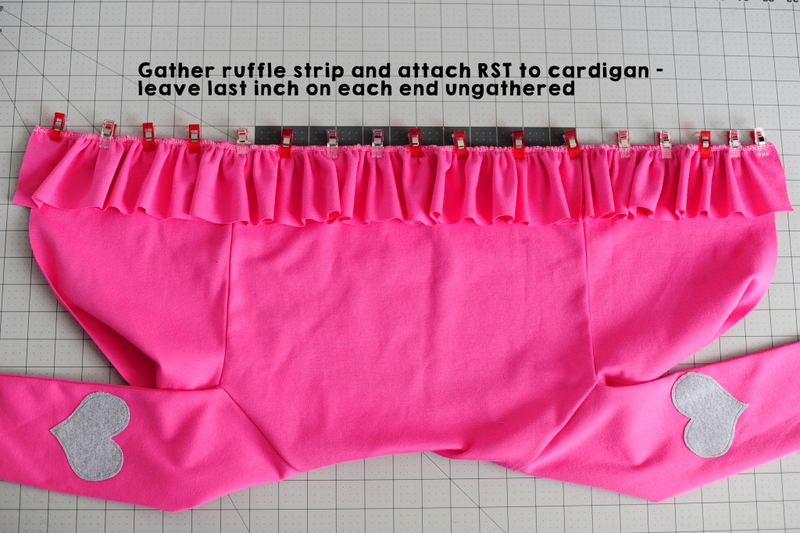 The teal cardi was hemmed, but I left the ruffles raw on the ivory and pink ones. I love using interlock for cardigans because it’s a pretty stable knit, so it is easy to sew with and also won’t roll or curl up on you. 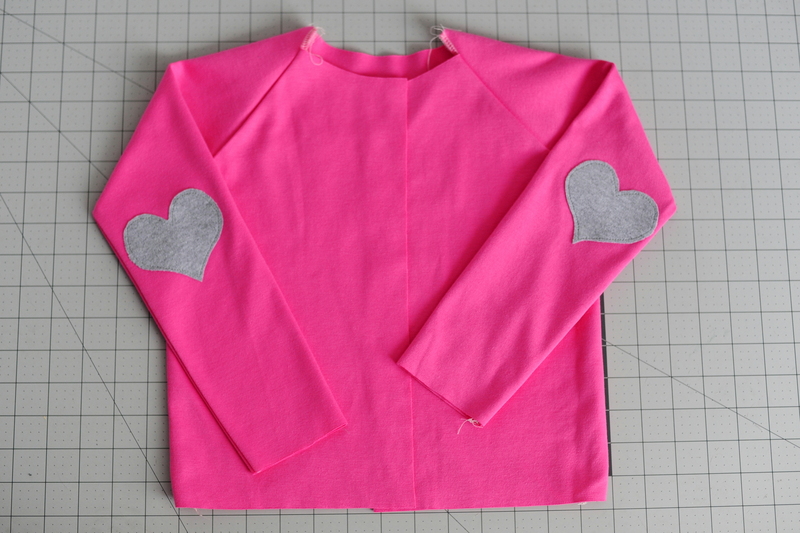 You’ll want to start assembling the cardigan per the pattern instructions – but make sure to add the elbow patches before you sew up the sleeve seams. 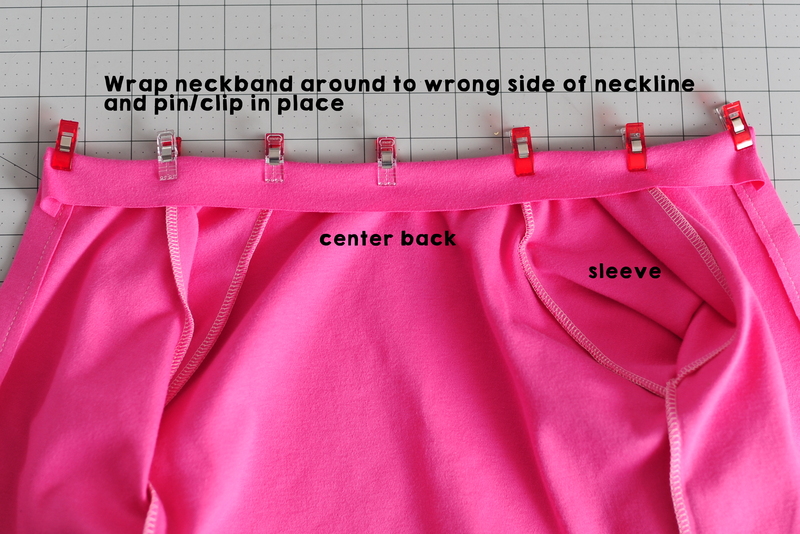 It’ll be MUCH easier to topstitch them this way! 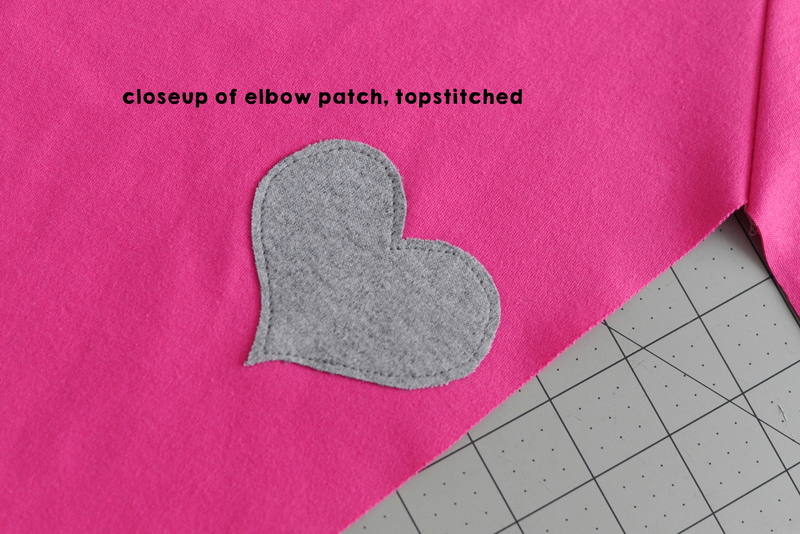 I like to clip the cardigan closed and mark the patch placement by holding it up to my kid before ironing on the patch – I use Heat n Bond lite to adhere the patch and then topstitch with a fairly short straight stitch. 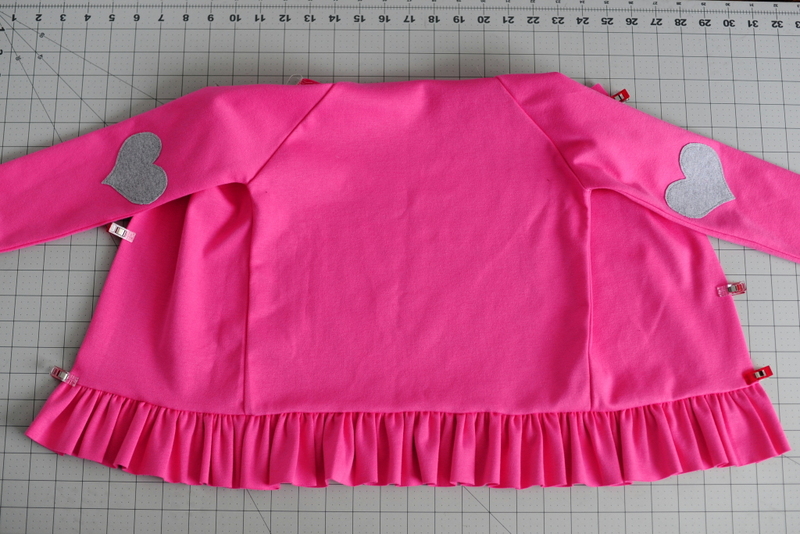 Then you’ll sew up the sleeve and side seams, and prepare your ruffle if you haven’t already. 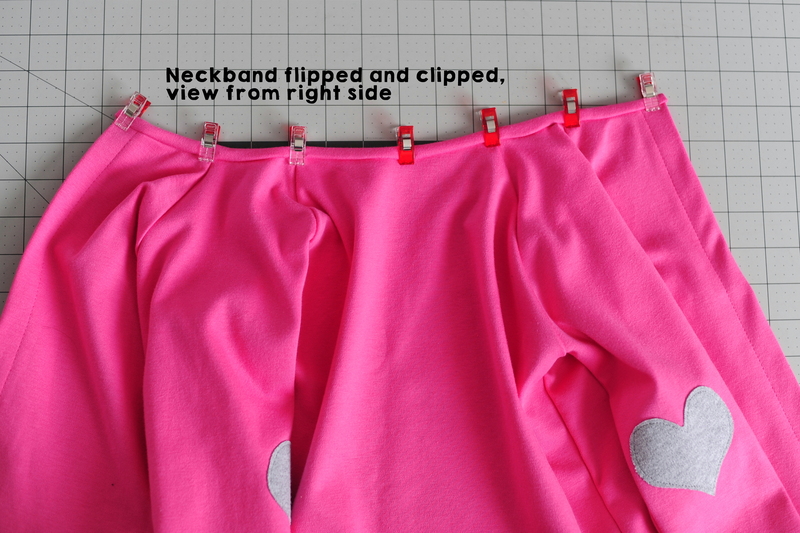 You’ll want to pin (or clip – I love Wonder Clips and use them for everything these days) the ruffle to the bottom edge of the cardigan, right sides together. I found it easiest to leave the last inch unruffled on each end, as that will become part of the placket. 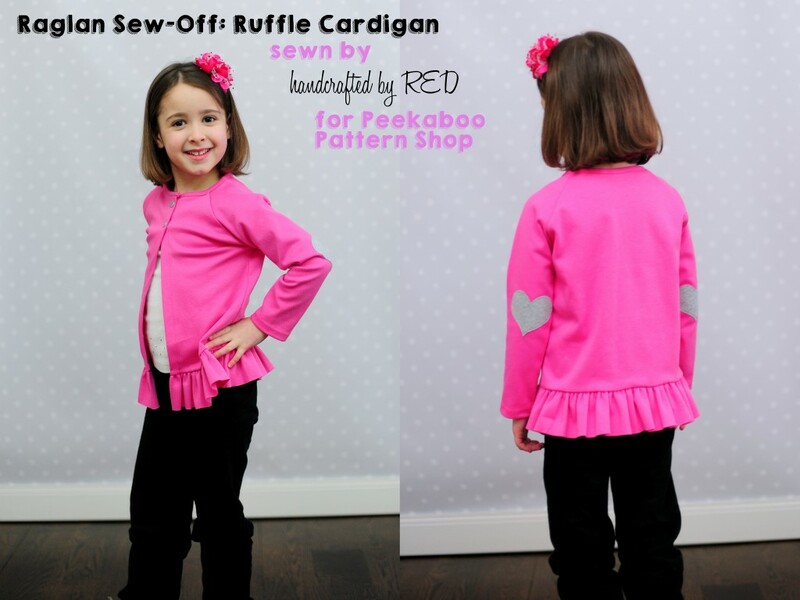 Sew the ruffle to the cardigan, and press the seam up toward the bodice. 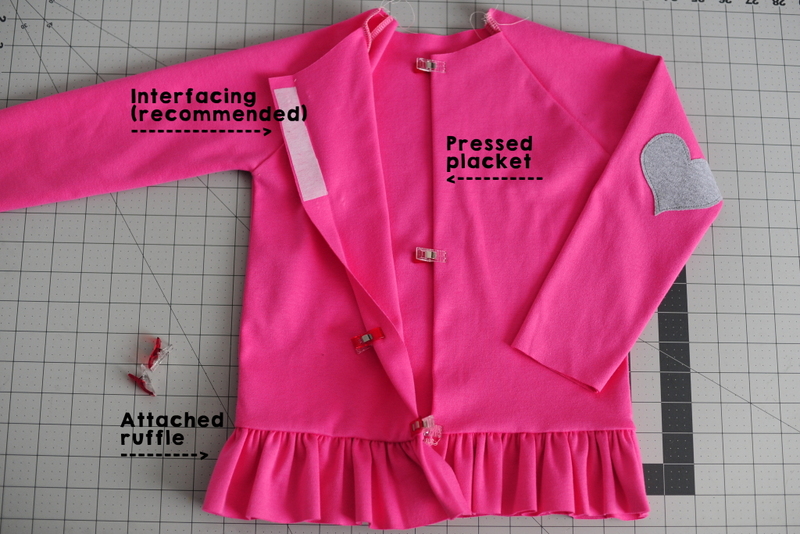 Topstitch if desired. 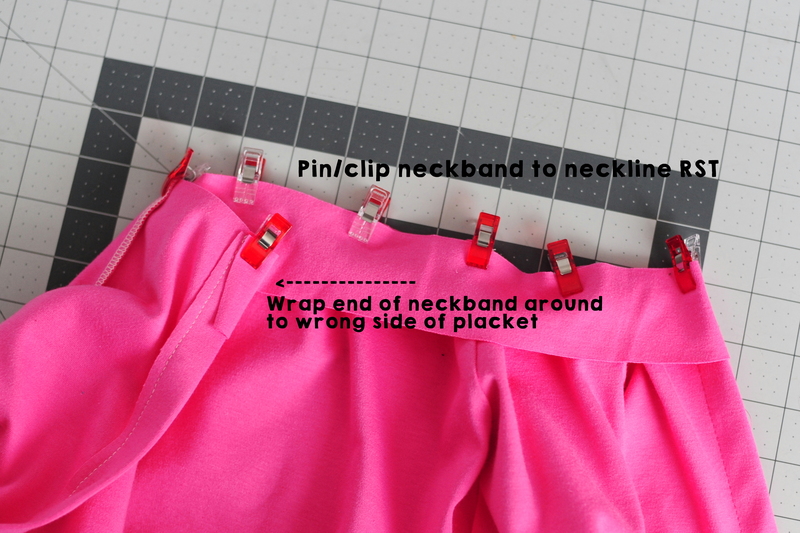 Next you’ll want to press your placket about 3/4″ toward the inside of the cardigan, from neckline to bottom of the ruffle, and add a small strip of interfacing if you’ll be using snaps or buttons to close your cardigan. Topstitch the placket with a slightly lengthened straight stitch from neckline to where the ruffle meets the bodice, and then all that’s left is to bind the neckline and hem the sleeves. You can see that I scooped the front neckline a little lower than is indicated by the pattern piece, so I’ve got little “wings” at the top of the sleeves that I need to trim back a little. I actually like to do this for all of my Grand Slams (even the regular, non-cardigan shirts) as I have found that the neckband sits better and flatter for me this way. There are a number of ways you can bind the neckline, but for this I decided to just do a narrow binding. 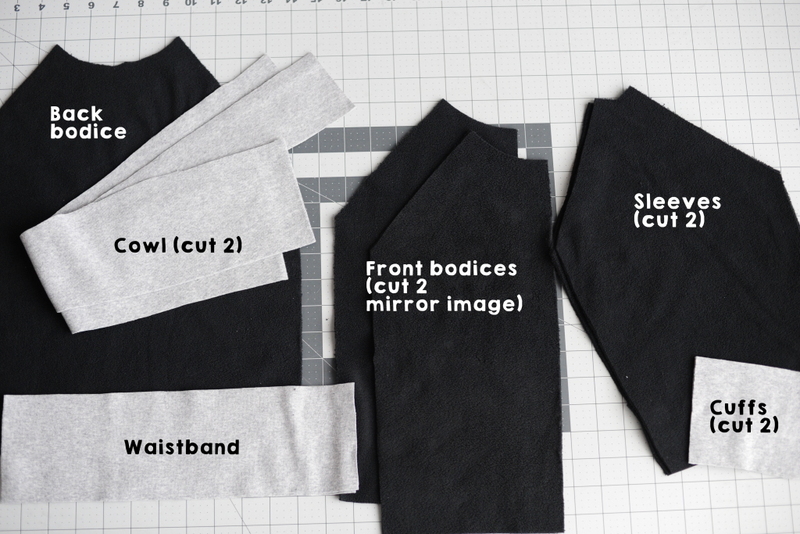 I cut my binding strip to 2″ long x the width specified in the pattern, plus about an inch extra. If you’re using regular binding or something that has a lot of stretch you may not need to add much, but this interlock had little stretch. 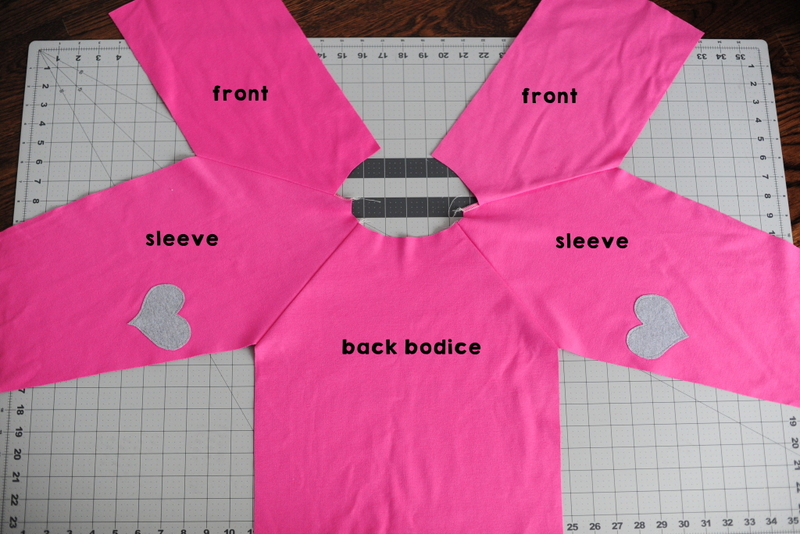 Pin/clip the binding to the neckline right sides together, and wrap the ends around to the wrong side about a half inch on both the left and right front bodices. 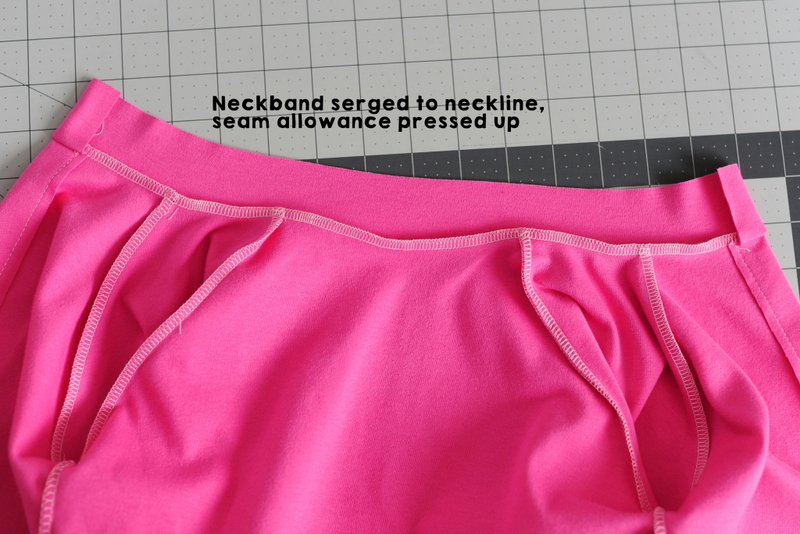 Serge (or sew – with a stretch stitch) the binding to the neckline, and press the seam allowance up. You’ll notice that the ends that we wrapped around the placket form a nice finished edge here. Pull the binding up over the seam allowance, and wrap it over to the wrong side of the cardigan, pinning frequently to hold it in place. 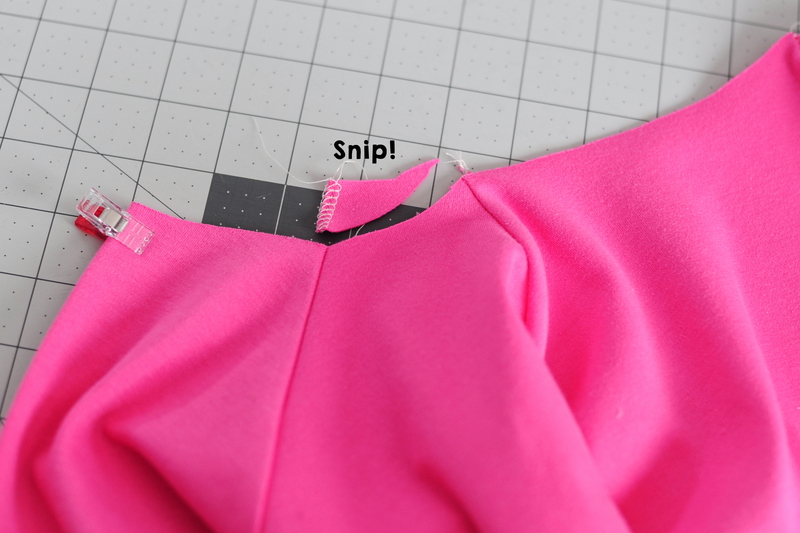 I use a long straight stitch to topstitch the binding since the cardigan won’t have to get pulled over my daughter’s head, and then just trim off the excess from the inside making sure not to cut through my topstitching. 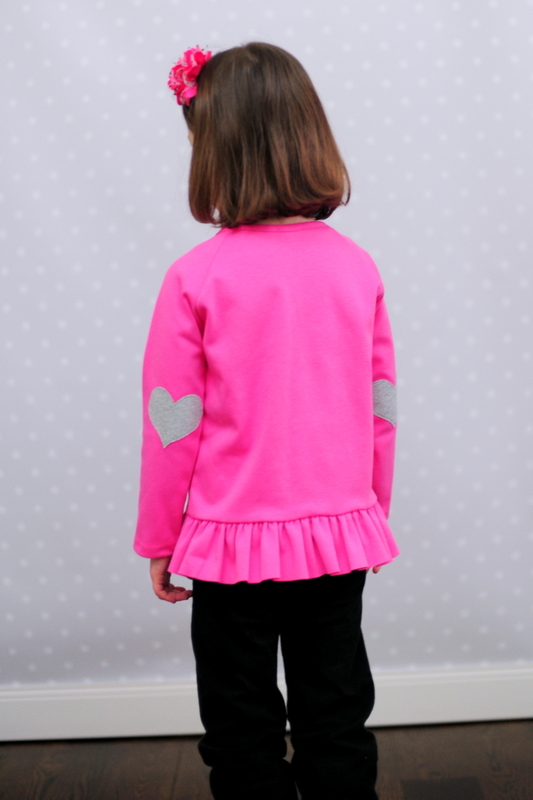 Add buttons or snaps as desired (as you can see, my daughter wanted all of hers to have only 2 snaps at the top and have more of a “flyaway” look at the bottom), hem sleeves, and find a kiddo to make happy.